Malaria occurences in Indragiri Hulu Regency (INHU) are increasing each year. The increasing of malaria cases may be caused by the weakness of malaria surveillance system in all levels. The aims of this reasearch are determining the implementation of the malaria surveillance system and evaluating malaria program in Department of Health in District INHU from 2008 until 2010. The research was quantitative descriptive designed as a case study conducted by interviewing and document searching Quantitave descriptive as case study was designed to investigate the implementation of malaria surveillance system and to evaluate malaria program in Health Office of INHU District 2008-2010. Data obtained from interview and documents review.. The research subjects were official engaged in malaria surveillance system who were chosen by non random technique using purposive sampling. The result of this study shows This study showed that the implementation of malaria surveillance system was generally considered less. Most of Malaria’s patients in the years 2008-2010 at Indragiri Hulu more was in males is 55.3%, with the largest mostly in the age group 15-54 years is (50.7%), and 76.1 % the most in Kulim Jaya subdistrict. is 76.1 ‰ In generally, malaria case occured at September. Most commonly the case in September. 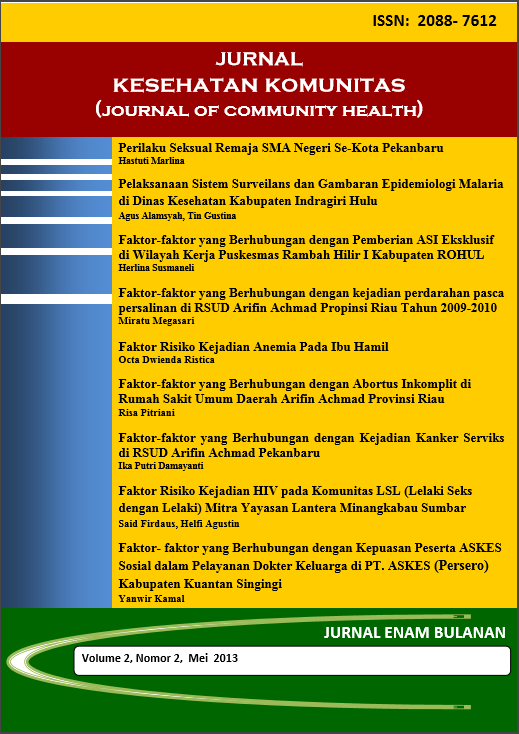 This study suggests improvement of malaria surveillance activities and malaria program implementation, human reasources and budget from health office of INHU District. Department of Health in District INHU is expected to improve malaria surveillance activities and malaria program implementation, improve the quality and quantity of human resources and budget more funds for this activities.